Explore the stage and be heard loud and clear. Relay let you play your guitar wirelessly without compromising your tone. It delivers renowned 24-bit digital wireless sound quality and full 10Hz-20kHz frequency response, so you’ll hear your guitar tone in amazing detail. And with a wide dynamic range of more than 110dB, you’ll hear the full frequency range of your guitar or bass—from the highest of highs to the lowest of lows. Plus, innovative Cable Tone* technology matches the unique character of a standard guitar cable. 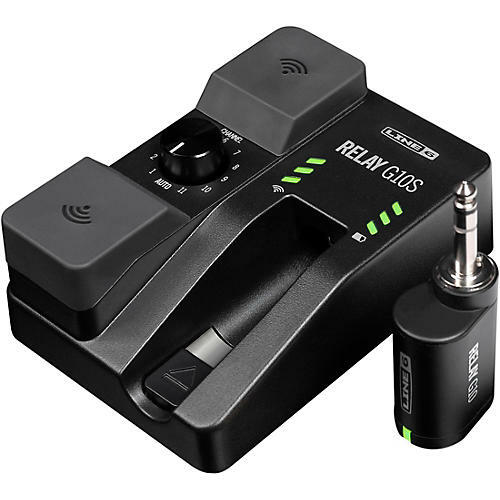 Relay features the most advanced digital wireless technology in the industry—the same technology that professional guitarists use on stage every night. Not only does Relay deliver incredible audio quality, it sets the standard for simplicity, reliability, and performance. Basically, it just works great—every time you plug in. Play your guitar wirelessly on any stage in the world.